Standard lighting package includes both Outside Circle and 6-Point Star fluorescent lighting. All lighting equipment is metal-mounted, 3-wire grounded type. Optional Chasing INCANDESCENT LIGHT packages available. Length 61 ft. / 18.6 m.
Width 40 ft. / 12.2 m.
This Wheel has the same dimensions and passenger capacity as the Signature Series Electric Rim Drive #5 BIG ELI Wheel shown below. This style Wheel is the one Mom and Dad and Grandma and Grandpa grew up riding at parks and county fairs throughout North America. This shows the traditional cable-drive and Star Lighting Package which was the original design in 1912. It is a beautiful Wheel and many are still operating. Eli Bridge Company still repairs, refurbishes and sells parts for these Wheels. These Wheels take a much more trained, expert operator to properly run. Because of the cable-drive, this Wheel must be very carefully balanced and operated with a seasoned touch. Since the availability of experienced operators is so limited, Eli Bridge Company no longer manufactures the cable drive models. 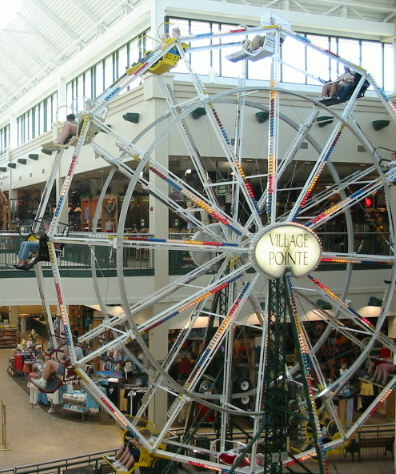 NOW LOOK AT THE NEW ELI WHEEL BELOW! 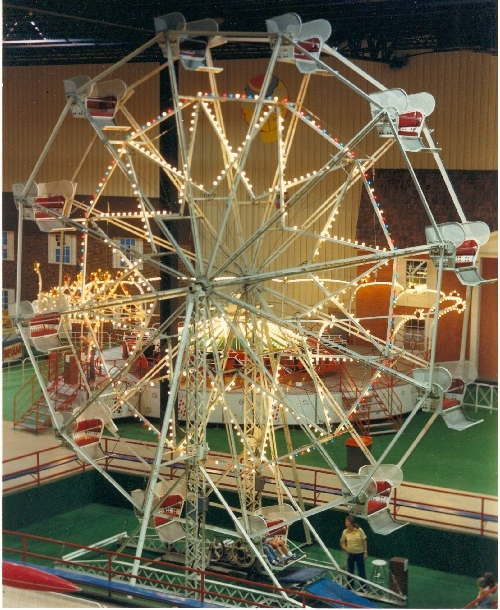 The Signature Series Electric Rim-Drive Wheel is far superior in terms of decreased operator training time, ease of operation (much less of a balancing challenge), a smoother, quieter ride (very indoor/mall-friendly), built-in interlocking safety features and far more lights and flash. It makes more money but still has the nostalgia of Americana at its best! The brakes and loading platform are built with a pneumatic system with interlocks to prevent brakes from engaging or releasing before loading platform is in the proper position. Air Tank capacity has enough on-board air to unload all seats in case of power loss. Deluxe: Programmed Incandescent Lights with double star, tower, top tower and cluster lights in a variety of colors. Chaser and light controls on trailer for easy maintenance. Signature: Programmed incandescent spoke and perimeter lights, tower, and cluster lights in a variety of colors with programmed modules in light bars, "over axle" center back-lit "Signature Sign" with custom logo and incandescent lights on the outside. 200 Total Amp Service @ 208/220 V.
Pneumatic with interlocks to prevent brakes from engaging or releasing before platform is in proper position. Programmed incandescent lights with double star, tower, top tower and cluster lights available in a variety of colors. Chaser and light controls on trailer for easy maintenance. Programmed Incandescent Lights with double star, tower, top tower and cluster lights in a variety of colors. Chaser and light controls on trailer for easy maintenance.